One of the joys of the holidays is the chance to see extended family. For many years, my family enjoyed the good fortune of gathering with four generations. I cherish those photos and memories. At these multigenerational celebrations, it’s not unusual for older relatives to struggle with hearing loss. Up to a third of adults between 65 and 74 years old, as well as half who are older than 75, struggle with some degree of hearing loss. If even one of your family members faces this challenge, as we did, you know the whole family struggles right along with them. Below, I share a few ideas to help celebrations run more smoothly for everyone. You may want to discuss these modifications with the host or another family member, so a potentially awkward discussion about hearing loss doesn’t happen during the event itself. Turn on the television’s subtitles function. You might even attribute the change to a young reader who likes the extra reading practice. Establish a television-free zone for easier conversations and periods of rest. Turn off any background music, especially during meals. Turn up the lights during meals. Although you may prefer dim lighting and candles, it makes it more difficult for someone who is hard of hearing to read cues. Try to keep your face visible and use expressions or gestures when appropriate. Consider seating selections at the table. Place the adult with hearing challenges in a livelier area of the table. It might make the person feel more involved and is easier than sitting at the quiet end where louder voices become “background noise.” Placing that person near an empathetic listener who will repeat as needed also helps. Booming, deep voices are also easier to follow. The search is on to better understand “hidden” hearing loss—and diagnose it. An audiologist and SLP share ways to address hearing loss in older patients—especially those with dementia. 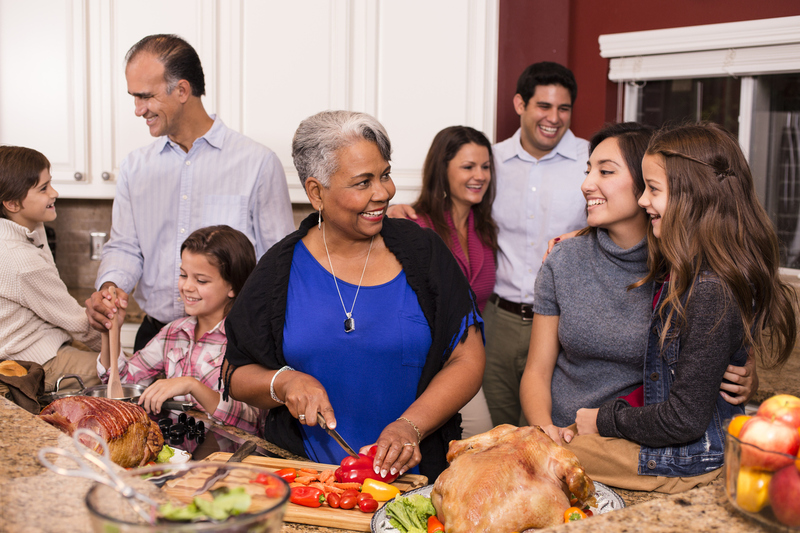 Use family events as a good opportunity to see if someone struggles to hear or, if the person already uses hearing aids, to see if they get used effectively. Missing conversation or making seemingly unrelated comments might raise a concern. Inattentiveness, being easily distracted and showing signs of boredom can all be signs of hearing loss. Depression is also a risk for adults with hearing loss. Frequent requests to repeat what’s been said or to turn up the TV/radio volume might indicate hearing struggles. Provide an easy craft or activity for older adults to do with the children. This might include supervision of cookie decorating, writing place cards that children then decorate with stickers, or reading stories to each other. Board games based on counting and moving rather than talking also provide fun for both parties. Offer a “trailer” before conversations. Toddlers and young children might be especially difficult to understand due to their high pitch and misarticulations. Give the adult a head start by saying, “Hannah wants to show you her new doll named Anna” and give the child a prop to hold—like the doll—as well. Prior to the meal, ask if he or she will give a toast or blessing. This helps the person feel like an integral part of the meal. Be patient and encourage the use of hearing aids or other assistive devices. Wishing you and your family a very happy holiday season! Editor’s note: This article was originally published in December 2015. Kimberly Swon Lewis, MEd, CCC-SLP, is a pediatric SLP in Greensboro, North Carolina, and the author of the Activity Tailor blog. kim.lewis@activity.tailor.com. Communication in the 21st Century: Effective or Flawed?